Santa Paws and Mrs. Claws with Brook Magee and WendyP Designs is a delightful tribute to your furry family this holiday season. Want to document Fido in his adorable sweater? Or remember how Whiskers the cat always hides in the tree? 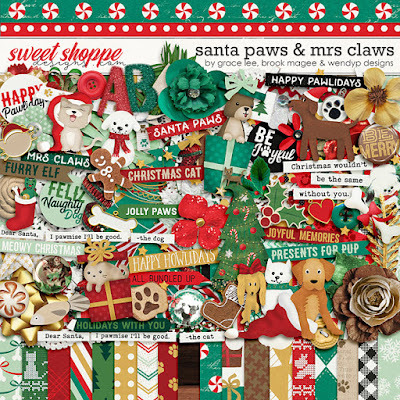 This cute triple dip kit is filled with hand drawn cats & dogs and lots of fun Christmas elements. Perfect for making sure your fur-baby makes it to the pages of your holiday album! and 90+ elements. The elements included are: buttons, flowers, foliage, frames, bows, doily, assorted dog & cat illustrations, trees, vintage ephemera, fabric flower, paper star, ribbons, snow cat & snow dog, stocking, string lights, word strips, charms, flair, paint, scatter, fabric yo-yos, dog bone, dog cookies, fish, holly, ric rac banner, stars, stitches and more.